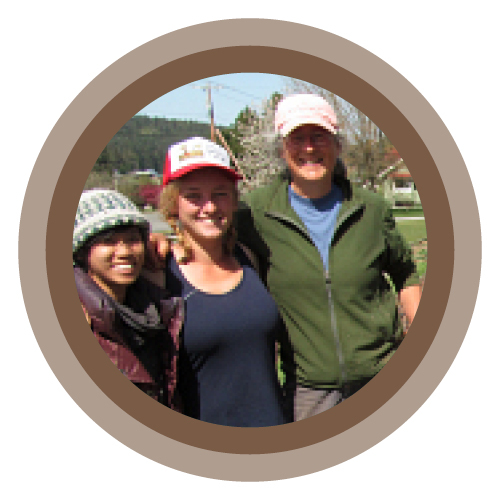 Every month during the growing seasons, Community Garden Leadership Training apprentices and program managers take a field trip to a different community garden, farm, or food centered non-profit around Cascadia. Some of favorite field trips have included visits to the public school gardens on Lopez and Orcas Islands and to the Bellingham Food Bank. We take these trips to get gardening ideas and to expose apprentices to similar organizations that they may look to for future employment or inspiration. For the past three years, we’ve been visiting Garden Raised Bounty (GRuB) in Olympia. A well-established non-profit, GRuB uses the growing of good food to empower people and strengthen community. There are many branches to the organization, and its always amazing to see how they continue to evolve over time. They redirect disengaged youth, giving each one a job and sense of purpose. They also run a youth-powered community supported agriculture program and help community members in need build their own backyard gardens. The work GRuB’s been doing with high schoolers has been so effective that the principal of Olympia High recently asked them to start a whole farm specifically for students who weren’t thriving in a traditional academic setting. We always love visiting the folks down at GRuB. Not only do we pick up many helpful gardening tips about composting and vigorous vegetable varieties, we also leave feeling inspired. The people working at GRuB love what they do and they see people’s lives being changed everyday. They truly believe that having access to good food is a human right and that the act of growing it together can be a joyful and empowering process. Header photo, at GrUB; mural photo, on Orcas; sidebar garden photo, on Lopez. All by Cary Peterson. Halo photo, at Good Cheer Garden, by Lissa Firor.